United States This is a cross breed of a Pug and a Beagle. This is not a recognized breed. Will vary. Research both Pugs and Beagles for coat possibilities. May take after one or both breeds. This is a sociable and easy-going breed who is intelligent and calm. This is a sociable and easy-going breed who is intelligent and calm. The Puggle gets along well with children, other dogs and household pets. It may show signs of jealousy, however, if it feel ignored by it's owner. 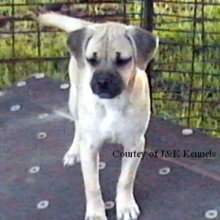 You can find Puggle puppies priced from $350 USD to $1400 USD with one of our credible breeders. Browse through our breeder's listings and find your perfect puppy at the perfect price. The Puggle gets along well with children, other dogs and household pets. It may show signs of jealousy, however, if it feel ignored by it's owner. Brush ocassionally. Average shedder. Bathe only when necessary. Intelligent dog. May be slightly stubborn at times. Consistent training. Okay for apartment life. Needs some daily exercise to avoid boredom. Likes walks and play time. Puggle Puppies for Sale - Shipped Worldwide! Finding the right Puggle puppy can be dog gone hard work. PuppyFind® provides a convenient and efficient means of selecting and purchasing the perfect Puggle puppy (or Puggle puppies) from the comfort of your home, 24 hours a day, 7 days a week. Take advantage of our PuppySearch or leisurely browse our directory of hundreds of dog breeds, Puggle dog breeders, Puggle dogs for adoption, and Puggle puppy for sale listings with photos and detailed descriptions. Some Puggle puppies for sale may be shipped Worldwide and include crate and veterinarian checkup. Many Puggle dog breeders with puppies for sale also offer a health guarantee. With thousands of Puggle puppies for sale and hundreds of Puggle dog breeders, you're sure to find the perfect Puggle puppy.